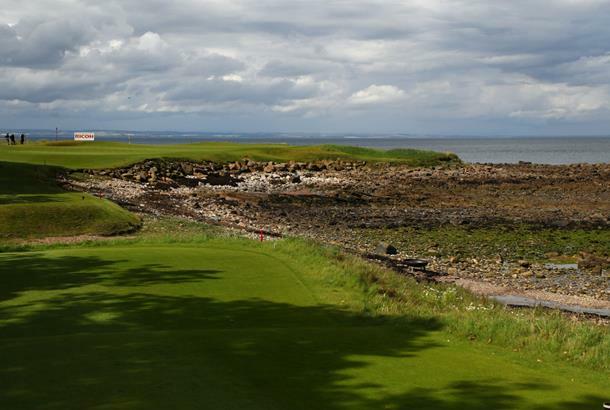 Kingsbarns Golf Links plays host to the Ricoh Women's British Open this week, but there is one notable change to the course. Kingsbarns has been a co-host of the European Tour's Dunhill Links Championship since 2001 with St Andrews and Carnoustie, but the Ricoh Women's British Open marks the first year the course will hold a major over four days. For those who have played Kingsbarns before, you'll most likely remember a relatively blind tee-shot to the par-four 1st located to the left of the clubhouse. Or perhaps you'll remember approaching the elevated 18th green that has a bunker at the back and a burn at the bottom of the intimidating hill-face protecting the putting surface, awaiting the invetible person (me the last time I played) that chunks it straight in to the drink. Yet that won't be the course the World's best female golfers will encounter this week. The regular 18th hole becomes the 17th, the 1st becomes the 18th, and the par-three second hole becomes the 1st. Why? We caught up with Kingsbarns Golf Operations Manager Garry Forrester to find out all about the new layout, the best viewing spots and the keys for players to do well this week. Q. How has the course been changed from the way it is normally set-up and why? The reason behind this is there is much more land to assemble the hospitality and grandstands which isn't possible around our 18th hole. Also, an added bonus from this are that the views from the first green along the coast line up to Crail Golfing Society (the 7th oldest golf club in the world) are stunning. Q. Have their been any notable changes to the rest of the course for the tournament? Garry: The course itself hasn't been changed much in any way, i.e the fairways are still the same width and the rough hasn't been grown specifically for the event. Basically playing the same as it does all year. I think the course is going to play very fair but the pin positions are where they can lend themselves to some trickery. The greens are quite undulated and over the course of the four days could test the players, especially if the wind blows strongly. Q. For spectators, where can they head to find the best viewing spots on the course? Garry: Behind the (tournament) 3rd Green is an excellent spot as you are up on a hill and can see players putting out on the 1st green, can see the whole of the par-5 second hole and 3rd hole and teeing off on 4th hole. Q. What is the biggest key for players to do well this week? Garry: The forecast at the moment looks to be quite mixed with some showers and quite breezy, so driving the ball and being in the right position is important this week. If you can drive the ball well the course can be very scoreable with some relatively short irons in. Good putting and strategically putting your ball in the right position will help! Q. Where are the trickiest and most scoreable holes out there for players? Garry: The trickiest holes on the golf course for me this week are the 6th, 14th, 16th and 17th, while there are a few chances out there – notably the 2nd, 4th, 5th, 8th, 13th, 15th & 18th.